2 Accreditation: A goba too to support Pubic Poicy Standards, accreditation and conformity assessment are market-based toos that can be used by Government poicy makers to deiver better reguation, environmenta protection, pubic safety, fraud prevention, fair markets and pubic trust. These toos are not as widey known and understood, or used, as they shoud be. However, there are many instances around the word where the pubic sector has embraced accredited conformity assessment as a means of deivering pubic poicy objectives. 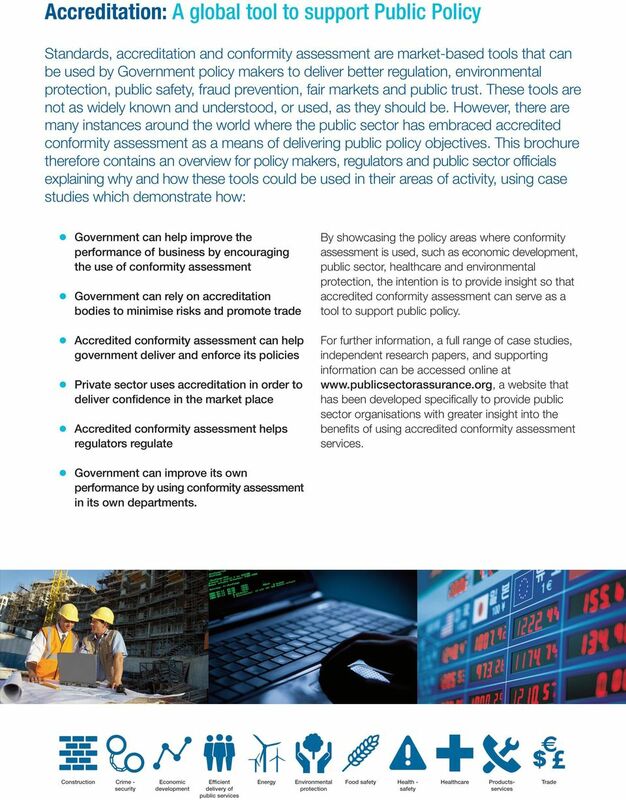 This brochure therefore contains an overview for poicy makers, reguators and pubic sector officias expaining why and how these toos coud be used in their areas of activity, using case studies which demonstrate how: Government can hep improve the performance of business by encouraging the use of conformity assessment Government can rey on accreditation bodies to minimise risks and promote trade Accredited conformity assessment can hep government deiver and enforce its poicies Private sector uses accreditation in order to deiver confidence in the market pace Accredited conformity assessment heps reguators reguate Government can improve its own performance by using conformity assessment in its own departments. By showcasing the poicy areas where conformity assessment is used, such as economic deveopment, pubic sector, heathcare and environmenta protection, the intention is to provide insight so that accredited conformity assessment can serve as a too to support pubic poicy. For further information, a fu range of case studies, independent research papers, and supporting information can be accessed onine at a website that has been deveoped specificay to provide pubic sector organisations with greater insight into the benefits of using accredited conformity assessment services. 3 What is the reationship between standards and accreditation? Standards are an agreed way of doing something; they are documents that capture current good practice through trusted and transparent processes invoving a reevant stakehoders in the drafting process. Accreditation determines the technica competence and integrity of organisations offering conformity assessment services such as testing, certification, inspection and caibration based on internationa standards. Accreditation can thus be used to verify compiance with a standard. 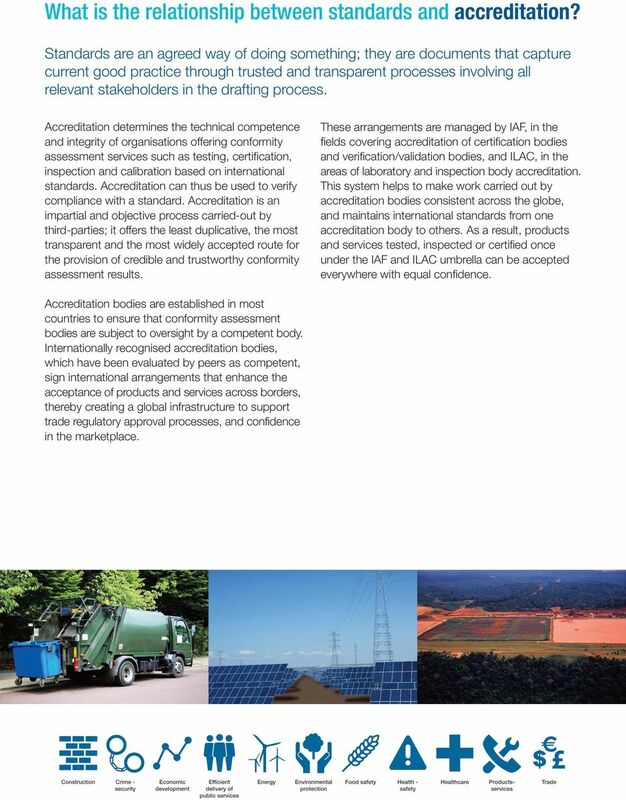 Accreditation is an impartia and objective process carried-out by third-parties; it offers the east dupicative, the most transparent and the most widey accepted route for the provision of credibe and trustworthy conformity assessment resuts. Accreditation bodies are estabished in most countries to ensure that conformity assessment bodies are subject to oversight by a competent body. Internationay recognised accreditation bodies, which have been evauated by peers as competent, sign internationa arrangements that enhance the acceptance of products and services across borders, thereby creating a goba infrastructure to support trade reguatory approva processes, and confidence in the marketpace. These arrangements are managed by IAF, in the fieds covering accreditation of certification bodies and verification/vaidation bodies, and ILAC, in the areas of aboratory and inspection body accreditation. This system heps to make work carried out by accreditation bodies consistent across the gobe, and maintains internationa standards from one accreditation body to others. As a resut, products and services tested, inspected or certified once under the IAF and ILAC umbrea can be accepted everywhere with equa confidence. 4 How can accreditation support pubic poicy? Accreditation can be used to support Government poicy in different ways. For exampe, markets can sef-reguate through businesses vountariy agreeing to meet set standards. This can be appied where there is a need to reassure markets on the conduct of business whie minimising risks, but where there is no desire by Government for reguatory intervention. For exampe, an industry or profession might choose to deveop and adopt its own code of practice promoting ethica conduct. Government can encourage the use of standards to deiver poicy, or indeed may wish to sponsor the creation of a standard for a particuar purpose. Government might aso work with an industry to deveop a standard or code of practice or a means of determining compiance that invoves other parties in setting standards and authorising the activity. Accredited conformity assessment provides this assurance of compiance with such standards. 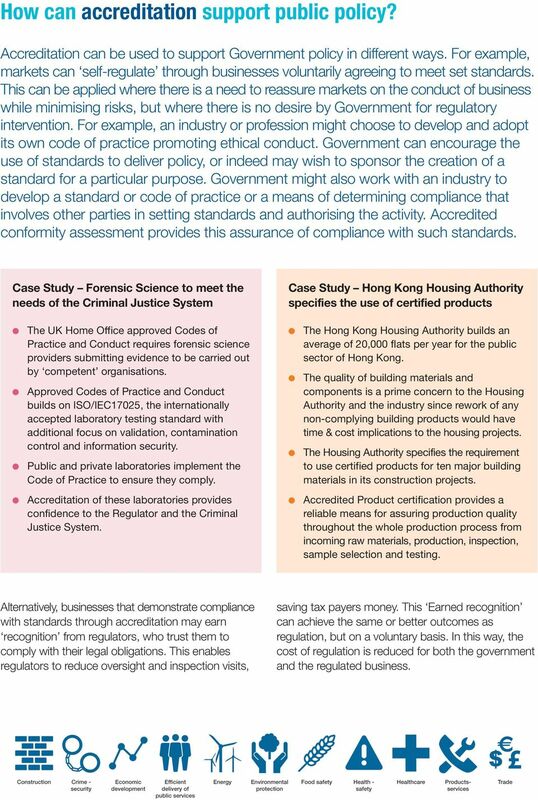 Case Study Forensic Science to meet the needs of the Crimina Justice System Case Study Hong Kong Housing Authority specifies the use of certified products The UK Home Office approved Codes of Practice and Conduct requires forensic science providers submitting evidence to be carried out by competent organisations. Approved Codes of Practice and Conduct buids on ISO/IEC17025, the internationay accepted aboratory testing standard with additiona focus on vaidation, contamination contro and information security. Pubic and private aboratories impement the Code of Practice to ensure they compy. The Hong Kong Housing Authority buids an average of 20,000 fats per year for the pubic sector of Hong Kong. The quaity of buiding materias and components is a prime concern to the Housing Authority and the industry since rework of any non-compying buiding products woud have time & cost impications to the housing projects. The Housing Authority specifies the requirement to use certified products for ten major buiding materias in its construction projects. Accreditation of these aboratories provides confidence to the Reguator and the Crimina Justice System. Accredited Product certification provides a reiabe means for assuring production quaity throughout the whoe production process from incoming raw materias, production, inspection, sampe seection and testing. Aternativey, businesses that demonstrate compiance with standards through accreditation may earn recognition from reguators, who trust them to compy with their ega obigations. This enabes reguators to reduce oversight and inspection visits, saving tax payers money. This Earned recognition can achieve the same or better outcomes as reguation, but on a vountary basis. In this way, the cost of reguation is reduced for both the government and the reguated business. 5 Case Study Supporting sustainabe anima heath in Africa Case Study Food safety in Victoria, Austraia The Botswana Vaccine Institute (BVI) is a pubic company estabished through the technica cooperation between MERIAL, a eader in the research, manufacture and suppy of ivestock vaccines, and the Government. Accredited testing and certification ensures the quaity of the vaccines that they manufacture, generates interna efficiencies, reduces waste and saves money. The Prime Safe scheme in the Austraian state of Victoria works across a areas of the meat, poutry and seafood suppy chain. Operating a risk-based system of audits, where, the frequency of audits for icensees is set in ine with the eve of risk inherent in the product processed at the faciity. The greater the assessed risk, the greater the number of audits required. It aso improves market access and the eigibiity for new tenders, which is demonstrated by year-on-year growth. Two thirds of a vaccines produced at BVI are exported annuay to over 15 countries in Africa and the Midde East. The scheme recognises the benefit of accredited certification to ISO 9001 as, Any meat processing faciity subject to a quartery audit schedue and has incorporated into its operations an accredited ISO 9001 quaity assurance system can have their audit frequency adjusted to a bi-annua audit schedue. The accreditation system can aso support pubic poicy, where Government sets the top eve reguatory requirements and eaves the market to define how these genera principes shoud be met in terms of technica soutions. In some cases, the use of standards can be referenced in reguation. In others, the market itsef may decide to deveop standards for their own guidance on the technica state of the art and thus assist with compiance. Case Study The New Approach in the European Union Guf Coast Countries (GCC) operate singe Market Reguatory System The European New Approach to technica harmonization invoves over 4,000 standards that are used to support reguation. 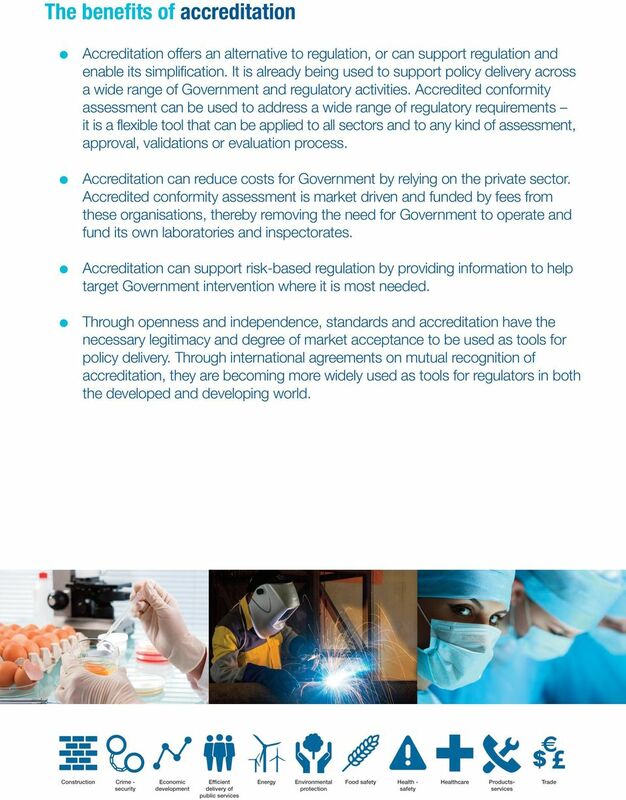 Under the New Approach, accreditation is used to ensure the competence of those organisations that check compiance with the standards ( Notified Bodies ). In ine with the Word Trade Organization s Technica Barriers to Trade Agreement (WTO TBT Agreement), compiance with reguation is mandatory and compiance with standards remains vountary. GCC Member states (United Arab Emirates, Kingdom of Bahrain, Kingdom of Saudi Arabia, Sutanate of Oman, State of Qatar, State of Kuwait and the Repubic of Yemen) operate a singe reguatory system to contro products in the GCC market. The System is comprised of two sets of Technica Reguations (TR) Horizonta Reguations appied to a products wishing to access the GCC Singe market, and Vertica Reguations each addressing a Category of Products such as Toys and ow votage devices. Accreditation is an essentia too for the impementation of this reguatory system as it is used in a reguations to assure the competence of notified bodies. 6 What benefit does accreditation provide? Accredited conformity assessment bodies can support, amongst others, the foowing functions: Verification of conformity with standards and reguations Demonstration of competence Assessment of risk and its management Enforcement of safety reguations such as buiding codes Safety of food and drinking water Environmenta protection Oversight of heath and socia care services Contro of commerce and trade Trade faciitation Efficient deivery of pubic services Conduct of forensic investigations Investigation of product or process faiures Case Study Underpinning the ENERGY STAR US energy efficiency programme Case Study Accreditation ensures quaity of stee imports into India ENERGY STAR is a U.S. Environmenta Protection Agency (EPA) vountary program that promotes energy efficiency. 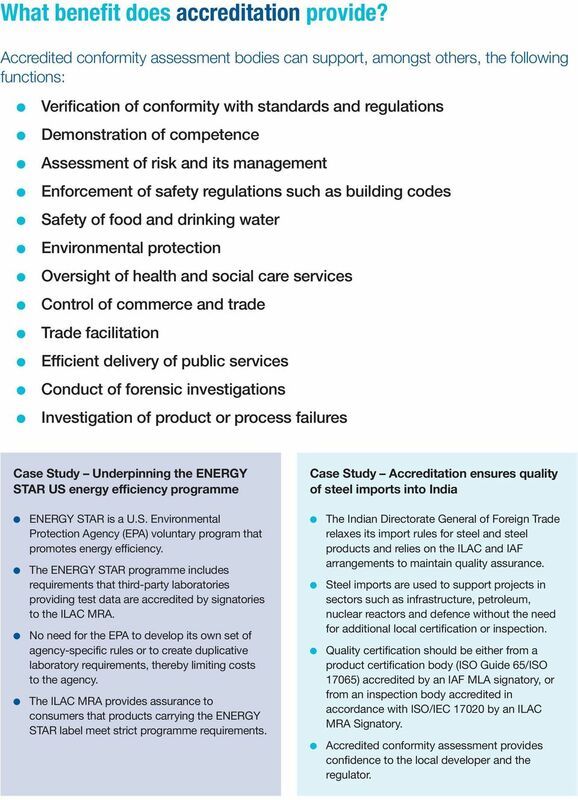 The ENERGY STAR programme incudes requirements that third-party aboratories providing test data are accredited by signatories to the ILAC MRA. No need for the EPA to deveop its own set of agency-specific rues or to create dupicative aboratory requirements, thereby imiting costs to the agency. 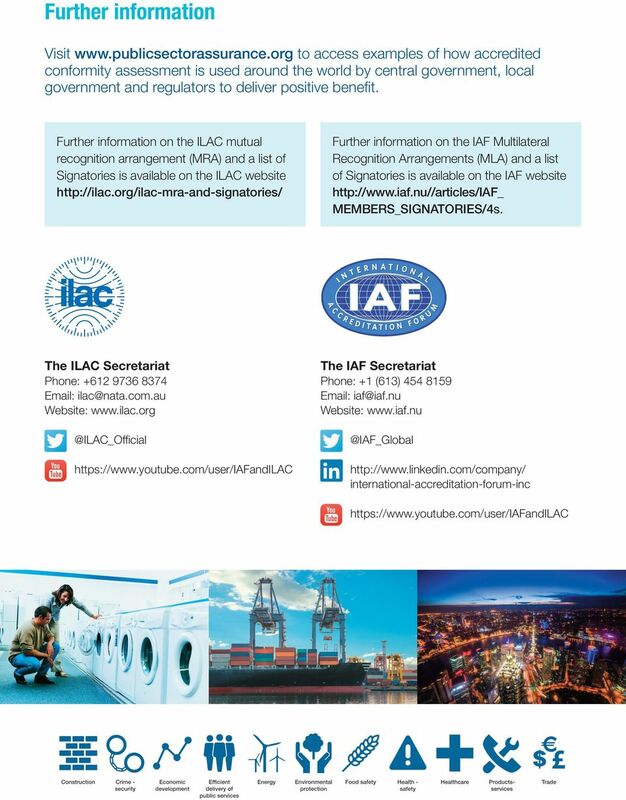 The ILAC MRA provides assurance to consumers that products carrying the ENERGY STAR abe meet strict programme requirements. The Indian Directorate Genera of Foreign Trade reaxes its import rues for stee and stee products and reies on the ILAC and IAF arrangements to maintain quaity assurance. Stee imports are used to support projects in sectors such as infrastructure, petroeum, nucear reactors and defence without the need for additiona oca certification or inspection. Quaity certification shoud be either from a product certification body (ISO Guide 65/ISO 17065) accredited by an IAF MLA signatory, or from an inspection body accredited in accordance with ISO/IEC by an ILAC MRA Signatory. Accredited conformity assessment provides confidence to the oca deveoper and the reguator. 7 The benefits of accreditation Accreditation offers an aternative to reguation, or can support reguation and enabe its simpification. It is aready being used to support poicy deivery across a wide range of Government and reguatory activities. Accredited conformity assessment can be used to address a wide range of reguatory requirements it is a fexibe too that can be appied to a sectors and to any kind of assessment, approva, vaidations or evauation process. 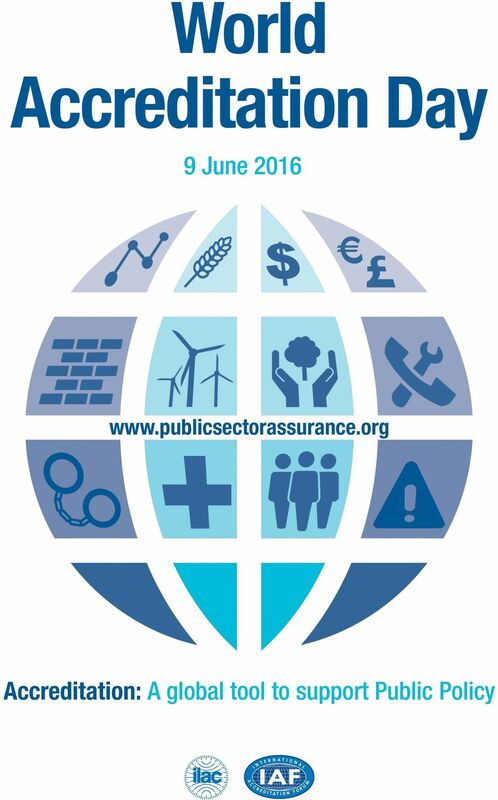 Accreditation can reduce costs for Government by reying on the private sector. Accredited conformity assessment is market driven and funded by fees from these organisations, thereby removing the need for Government to operate and fund its own aboratories and inspectorates. Accreditation can support risk-based reguation by providing information to hep target Government intervention where it is most needed. Through openness and independence, standards and accreditation have the necessary egitimacy and degree of market acceptance to be used as toos for poicy deivery. Through internationa agreements on mutua recognition of accreditation, they are becoming more widey used as toos for reguators in both the deveoped and deveoping word. Certified Once Accepted Everywhere. How does Accredited Certification benefit Regulators? How do I gain confidence in an Inspection Body? Do they need ISO 9001 certification or ISO/IEC 17020 accreditation?